Elon Musk has not been affected by the US Securities and Exchange Commission declaration and will keep his position. Despite an action for securities fraud, 20 million US dollar fine and his removal as chairman, he announced yesterday to want to buy more Tesla shares worth 20 million US dollars. Dax stumbles towards new lows. Does the crash actually happen? Corrections are inevitable and, in the long term, eminently important to markets. Moreover, they are – if you want to be honest – a little salt in the (stock market) soup, because now it is important to keep track and make the right decisions. The problem with corrections is often that you do not immediately recognize them as such. They sneak up and then surprisingly get going. For weeks, however, we have been broaching at this point the Dax’s inability to create a new upward momentum. He finally coupled with the developments of Dow Jones Ind. And Nikkei 225 and let themselves be more or less strongly involved, thus fading out a little of their own problems – a clear warning signal. The US indices and the Nikkei 225 are now stretched as draft horses until further notice and the result can be seen in the development of the Dax impressive. Simply find the right product. Over a period of 90 days and given price expectations, the Smart-Meter Profit Maximizer determines the following products for DAX. Define yourself the period and the price expectation in the Profit Maximiser. Two key issues are on the agenda for global equity markets – one being the fear of rising (in doubt even faster than expected) interest rates in the US and the fear of the impact of global trade conflicts; especially the effects of the US conflict with China. For the Dax, the topic of Italy and the Brexit hanging section also have a certain relevance. The mood is currently becoming increasingly gloomy, as well as the current ZEW data, which on 16.10. have been published. In the next week, more precisely on 25.10., There will be the Ifo data. Also, you should take a close look. Let’s get back to the Dax. Actually, after the failure in the resistance zone in the last issue, we had set ourselves 12,500 / 12,640 points for a leisurely sideways movement in the limits of 12,500 / 12,640 points on the top and 12,100 / 12,000 points on the bottom. But this expectation was known to be pulverized. At the latest with the falling below the 12,000 point was then also clear that the cozy time in the Dax is completed for the time being. The fact that the Dax then not in the range of the March low (11,730 points) came to a halt, reinforced the impression. Only in the range of 11,450 points, the movement came to a standstill. We once presented the current situation in a 3-year chart on a weekly basis to derive potential movement targets on the bottom. 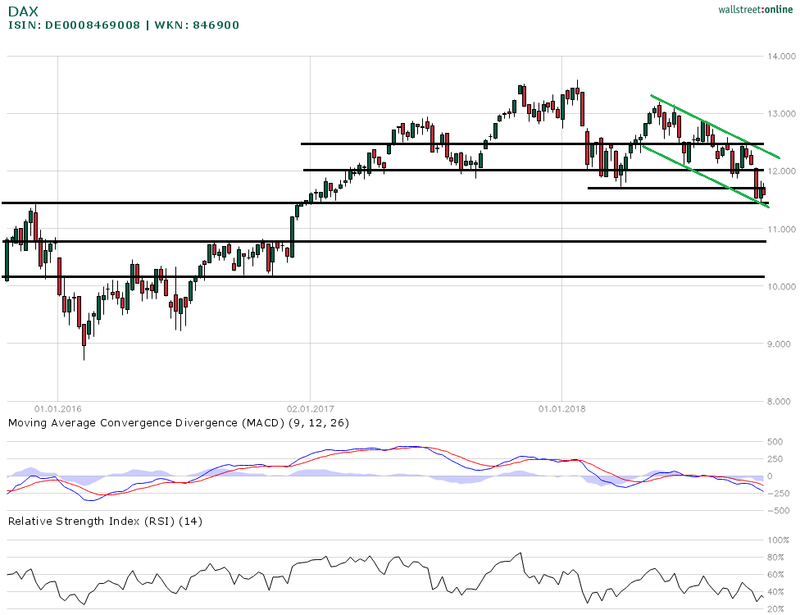 The Dax succeeded in the previous week to bring the first correction wave in the range of 11,450 points to a halt. Thus, a first important movement goal was achieved. The subsequent recovery, however, has so far missed a reasonable impact. Currently, the index is trading at 11,560 points and threatens to slide back towards the movement low. Should this also not be able to withstand the pressure of sales, the movement is threatened to continue in the direction of 10,800 points. However, if the index succeeds in recapturing 12,000 / 12,100 points, that would be an important sign of relaxation.In short: a Dax note below 12,000 points, in our view, continues to pose the danger of new sell-off waves. The 11,450 points should not be undercut, if not, would continue to threaten the movement to the range of 10,800 points. Currently “crash warnings” are booming again. This is not uncommon in correction phases. We do not (yet) go that far. A crisp downward movement in the direction of 10,800 points or even towards 10,200 points should, however, be taken into account. In addition, one should continue to follow the development of the gold price, because this also provides information about the sensitivities of investors. NETELLER enables conversion of more than twenty standard currencies to digital currencies within its system, solving the necessity to use online exchanges. Digital wallet and online payment provider NETELLER is now delivering its customers buying and selling directly digital currencies, including Bitcoin, Bitcoin Cash, Ethereum, Ethereum Classic, and Litecoin. The interesting feature is NETELLER’s task to offer exchange service of 28 fiat currencies to crypto coins using its system, imaginably avoiding the currently troublesome process of using crypto exchanges, or peer-to-peer platforms, or going to a bitcoin ATM, to acquire or dispose of funds. It all started last Monday when Bill Gates was quoted as saying he would short bitcoin if he could on CNBC. Determine The Optimal Bitcoin Trading Strategy For You. Do you consider Bitcoin as the future global currency? Do you have the technical skills to store bitcoin securely? Are you prepared and able to comply with the Tax regulations involved with trading Bitcoins? CFD is the ideal instrument for shorting bitcoins. Bitcoin has no intrinsic value and backed by no asset or entity. While Fiat currencies always in demand due to their legal status. UK’s citizens and firms are obligated to make all transactions using the GBP. Including paying taxes, salaries, and must accept GDP as payment. Bitcoin is merely the current digital craze which might be abandoned, replaced or corrupted at any time. Yesterday, it went down once and finished high. The position of 68-68.1 was more than once, rose to 68.7, and finally, it fell to around 67.6. There was not much fluctuation and market, and the general direction was still bullish. Change, as long as 67 has not broken, then the idea of ​more operations will not change, today after the callback in the 67.8 position involved more than one single, continue to look up to the high point of rebound can b 69.
the price of gold by the dollar impact of a substantial upside, continued to fall, yesterday, after a rally above 1326, has repeatedly been tested, finally ushered in a sustained decline in the stock market to drop eventually ending at 1315. On Tuesday, the U.S. dollar index maintained a continuous upward trend. During today’s intraday it traded through an integer mark of 91 in one fell swoop. The highest mark in nearly 14 weeks. In just six trading days, the trend of the United States Index has completed a reversal of the trend from an unfavorable course. The underlying reason behind this is the shift in people’s attitude towards central banks raising interest rates. When it comes to central banks, they can divide into two parts. One is the Fed, and the other is the central bank other than the Fed. This paper will use this as the main line to explain the reasons why people are expecting changes in interest rates and other factors affecting the US stock index. Factor. Yesterday evening, the United States announced that the Markit manufacturing and service PMI for April was better than expected. Specifically, the initial value of manufacturing PMI was 56.5, the highest since September 2014; the initial rate of service PMI was 54.4 higher than the forecast and the last month’s final value. Besides, US home sales in March also saw the second consecutive month of growth, and a series of positive economic data undoubtedly played a role in fueling the US dollar index. The US dollar index rose nearly 0.59 %, The most significant single-day increase since April. When Observing the recent data, the U.S. retail sales data was significantly better than expected last week. The Beige Book mentioned that the U.S. economy remains healthy and is expected to continue to grow and that U.S. Fed officials are fully confident of strong economic growth. Exceeding expectations also expected. The robust US economic data is the first reason to support the recent strength of the US dollar index. The positive economic data undoubtedly boosted the market’s expectations of the Fed’s rate hike four times during the year. Earlier, the United States has added one interest rate in March this year. The current interest rate range is from 1.5% to 1.75%. During the year, the rate hike is four times, and the last range is from 2.25% to 2.5%. From the chart, we can see that there is only one short one. During the week, expectations for raising interest rates four times rose from 24.9% to 31.8%. In addition to the expected change in the Federal Reserve’s rate hike, US Treasury yields are another factor supporting the US index. Judging from the data, the yield on the 10-year US Treasury bond also recorded a continuous rise and approached a crucial psychological threshold of 3%. The increase in US Treasury yields has forced it to continue to expand its bond yields with the eurozone. The difference between the yields of the Treasury bonds of the same period in Germany briefly touched the highest level in 29 years, and funds are usually borrowed from low-interest-raising currencies to purchase high-interest-rate investments. The currency to make interest rates, which makes the dollar further strengthened. When it comes to central banks, they can divide into two parts. One is the Fed, and the other is the central bank other than the Fed. This paper will use this as the main line to explain the reasons why people are expecting changes in interest rates and other factors affecting the US stock index. The chart below shows the CFTC USD position data as of the week of April 10th. From the previous data, it appears that speculative net short positions held by speculators increased by 620 contracts to 1,805 contracts, indicating that investors’ willingness to bearish on the dollar before two weeks warmed up. However, the recent skyrocketing trend of the US dollar has caused a short-run squeeze to stop the loss, which has aggravated the pattern of a stronger US dollar. On the 23rd of the local time yesterday, the US Senate Foreign Relations Committee voted through the appointment of the State Secretary of Pompeo. Earlier, due to the congressman’s belief that Pompeo’s lack of experience in foreign affairs and his attitude towards international affairs such as North Korea’s nuclear and Iranian nuclear affairs were too drastic and conservative, he encountered greater resistance from members of the Democratic Party in the nomination and appointment of the Congress. Now, Pompeo’s appointment will be submitted to the Senate for a total vote, and no surprise, Pompeo will be passed in the Republican Senate majority. It is worth noting that as one of Trump ‘s most trusted advisors, he is undoubtedly a sure-hearted solution to the stability of the US political situation. Also, the turmoil of the “Russia gate” incident has also resolved, because recently the White House spokesman Saunders said that Trump has no intention to dismiss special prosecutor Miller. On Friday European Central Bank President Mario Draghi said the euro growth area might have peaked. At the same time, it also shows the concern that trade protectionism has had some negative impact on global economic indicators. He also stressed that the current monetary policy still has uncertainty and needs patience. Draghi will hold a press conference this Thursday (April 26), according to its recent remarks will not announce the European Central Bank’s changes in QE policy. The Bloomberg survey also showed that only 36% of economists surveyed expected the European Central Bank to announce the end of QE in June, which is less than half of the survey conducted last month. Also, today at 16:00 Beijing time, it will be announced that the German IFO business climate index in April may not be as good as expected. As the economic locomotive of the eurozone, Germany’s economic impact on the entire eurozone is self-evident. And just this Monday (April 24th), the German Central Bank has made it clear that the slowdown in economic growth in the first quarter was due to unexpectedly weak manufacturing performance, so the future trend of the euro is still worrisome. On Friday (April 20th), Governor Carney spoke, revealing three significant concerns about the Bank of England’s current interest rate hike. First, the recent British data made the Bank of England eye-catching. The inflation rate was only 2.5%, a record low. Although it can be attributed to the weather and the unique “soft-economy start” in the UK, at least inflation does not support the British short-term rate hike. The second is about the progress of Brexit. At present, “soft Brexit” and “hard Brexit” still have obvious differences within the parliament. The political uncertainty also makes monetary policy more cautious. Third, he also mentioned that “the market need not pay too much attention to the time point of interest rate increase,” implying that the probability of a recent rate hike has become smaller. Through the above three points, the Bank of England released a clear dovish signal. At the beginning of last week, the US dollar against the Canadian dollar was still a process of continued weakness and low innovation. This was mainly based on people’s expectations that the preliminary North American Free Trade Agreement framework could be reached in May, which would benefit the Canadian dollar. However, Trump tweeted that the United States has linked Mexico’s border controls with the North American Free Trade Agreement and Mexico must prevent illegal immigrants from entering the United States. This, in turn, made the North American Free Trade Agreement casts a shadow. Before this, former Prime Minister Junichiro Koizumi stated that Abe might step down in June and Japan’s political situation had a problem. Once Abe stepped down to promote Abe’s economics, negative interest rate policies may cause uncertainty. This caused the yen ’s Weakness. Also, just yesterday Bank of Japan Governor Haruhiko Kuroda also stated that Japan must adhere to its strong easing policy and will not deliberately devalue the currency. Judging from the overall international situation, the United States has eased its relations with various countries. As for the situation in the Middle East, Trump has made it clear that the United States will withdraw its troops from Syria as soon as possible, which proves that this Syrian incident has not sustained. In addition to the events in Syria, the situation in the Korean Peninsula has also eased. Kim Jong-un has said that North Korea has no nuclear weapons, and he is focused on economic reports to calm the situation. Russia, the United States Treasury Department said that if Russia Oleg Deripaska gives up Ross control Aluminum United Company, the US will ease sanctions; also, the United States has extended the deadline for companies Rusal and gradually stop the transaction, This means that this suspension of sanctions against RUSAL. Lastly, regarding Sino-U.S. trade relations, U.S. Finance Minister Mukuchin also said on Saturday that he is considering going to China to negotiate trade issues and is “cautiously optimistic” about the possibility of an agreement between the two countries in resolving the dispute in the future. Therefore, as a whole, the attitude of the Middle East, the situation on the Korean Peninsula, sanctions against Russia, and trade friction with China have all eased. This will create a robust environment for the rise of the U.S. dollar index. The Real Reason Behind the “Dollar Shortage”. Recently, the Libor-OIS spread has continued to expand, and the ” dollar shortage” has intensified. On Wednesday, Libor rose again by 0.38% to 2.3246%, setting a new high since November 2008. At the same time, recent consecutive rises also set the longest increase cycle since November 2005. The Libor-OIS spread widened to nearly 60 basis points. Matt King, a global debt strategist at Citi, points out that the real reason behind the spread widening is related to the overall shortage of funds in the US dollar and tightened financial conditions. The recent sharp decline in the bank’s credit default swaps (CDS) has also confirmed this. King further pointed out that the widening interest rate spread indicates that the Fed is in a predicament, and any further tightening may lead to the spread of the financial crisis and further cause a shortage of US dollars. The Libor-OIS spread is an important indicator of how easy it is to obtain money in the money market. It mainly reflects the credit pressure of the global banking system. If interest spreads widen, it usually means that the willingness to lend to banks is falling. King believes that one of the key signs is that the sharp changes in interest rates may not be technical at all, but rather the Federal Reserve’s by-products of tightening currency. The impact of this by-product is more structured and dangerous, which means that the Fed is in a difficult situation. Any further tightening may lead to the spread of the financial crisis and further cause a shortage of the US dollar. We can see that the relatively modest evacuation of the central bank has suddenly produced wider consequences than expected, which has indeed caused a larger scale of deflation, just as we have two extra-than-expected Fed rate hikes . However, the problems we have encountered so far are not systematic. We do not have to worry that the banking system will collapse as it did in 2008 or 2012. However, we also expect that the current pressure will increase. However, as the Fed continues to lose excess reserves, the situation may be even more tense. The Fed is running out of reserves and now consumes 30 billion U.S. dollars every month, and then may increase to 40 billion U.S. dollars in the next quarter, and the pressure will steadily increase. So far, the tax reforms and the resulting changes in corporate finance have brought pressure. But the problem is that this situation will not disappear, and this is a structural change. Last year, 80% of the net purchases of U.S. corporate bonds came from foreign investors and mutual funds. They have stopped buying in the past few months and the market has always hoped that they will be able to buy as before. However, if you are a Japanese investor, your cost of hedging will increase from 2.50% to 2.75%, and you know that with each time the Fed raises interest rates, costs will increase. Suddenly, U.S. bonds are less attractive. Under the conditions of low global market sentiment, it is hard to believe that U.S. bond markets will rebound. Libor is still the reference benchmark interest rate for most leveraged loans, interest rate swap products, and some mortgages currently on the market. In addition to the direct impact on the aforementioned financial products, the higher money market interest rate (rising from rising Libor) and the weak performance of risk assets all contribute to the outflow of mutual funds. If the withdrawal of funds from mutual funds further exacerbates the selling of the market, the indirect negative impact of the wealth effect on the economy may even exceed the direct impact of rising market interest rates. The British Brexit Commission had a major intervention in the British Brexit debate last week as it urged Prime Minister Theresa May to consider the “Norwegian model” as an official alternative. Labor sources by the Clinton expressed cross-party committee of the European Parliament off Benn (Hilary Benn) leadership, if Theresa May failed to reach 15 goals in European negotiations off, perhaps you should consider the Norwegian model as options. These tests include: Maintaining the Irish soft border; trade between the United Kingdom and the European Union continuing, without incurring new costs; fully joining several European institutions. The EU has ruled out many tests. The reason given is that if the United Kingdom does not stay in the EU single market and customs union, these goals cannot be achieved. Britain’s Brexit Minister David Davis had previously ruled out the so-called “Norwegian model.” Davis believes that in many cases, this model will lead to the worst results in September. However, the British government has made concessions on many Brexit positions. If Theresa May fails to achieve her goal of negotiation, Britain may be forced to reconsider the “Norwegian model” that was rejected. What is the “Norwegian model”? Norway is a member of the European Free Trade Association (EFTA) and the European Economic Area (EEA). EEA members have the right to enter the EU single market, but also have the obligation to pay dues and comply with the main EU laws . At the same time, immigrants are free to go in and out, but they are not subject to EU regulations on agriculture, fisheries, justice and family-related regulations. The members of the European Economic Area also include the EU’s current 28 member states, Liechtenstein and Iceland. EFTA’s aim is to achieve in the Union free trade area among member countries and the expansion of industrial agricultural products ( 000061 , stock it ) trade; ensure that trade between Member States carried out under conditions of fair competition; development and expansion of world trade and the gradual removal of trade barrier. Its main tasks are: to phase out the tariffs and other trade barriers of industrial products within member states in order to achieve “free trade”; to maintain tariffs on industrial products in other countries; to expand trade in agricultural products; not to seek any form of European political integration. EFTA consists of four countries: Norway, Liechtenstein, Iceland and Switzerland. The group trades with each other and has signed free trade agreements with non-EU countries such as Canada , Mexico, and other countries. EEA membership applies only to the EU or EFTA member states. Therefore, if the United Kingdom leaves the EU in accordance with the “Norwegian model”, the United Kingdom can leave the EU, join the EFTA, and then become the 31st member of the EEA. If the United Kingdom leaves the EU in accordance with the “Norwegian model”, what are the benefits? If the UK can join EFTA and EEA at the same time, it can continue to fully enter the EU without having to bear the tariff. This will include the service industry. The service industry currently accounts for about 80% of the UK economy. Most studies show that this will be the least destructive model in Brexit. The British government’s own impact assessment found that from an economic point of view, the “Norwegian model” will be the least destructive option. Although Britain will retain full single market access, it will not be forced to sign some of the EU’s more controversial options. For example, Britain will not be forced to join the EU’s Common Fisheries Policy. For a long time, this has been a worrying issue for Brexitians. In addition, the “Norwegian model” will also exempt the common agricultural policy. How to deal with the controversial issue of the European Court of Justice? The Brexit people eventually decided to abandon the EU Supreme Court’s jurisdiction over Britain. According to the “Norwegian model”, the European Court has no jurisdiction over the United Kingdom. What are the disadvantages of the “Norwegian model”? The “Norwegian model” clearly has its own advantages, but it is not without criticism. Although Britain will eventually get rid of the EU court, it will be forced to reach an agreement with the European Free Trade Union Court. For most Brexitians, this only represents another irresponsible behavior that interferes with overseas justice. If it becomes an EFTA/EEA country, the United Kingdom has problems with its influence. According to the “Norwegian model,” the United Kingdom will fully enter the single market, but the right to speak in formulating rules is much less than that of EU member states. Critics of the “Norwegian model” accuse this way of gaining benefits by sacrificing the right to speak. Norway has not formally participated in the EU’s decision-making, but it has incorporated about 75% of EU law into its national legislation. How to deal with immigration issues? Immigration is obviously the most concerned issue. The public’s desire to control immigration can be said to be the greatest motive for the British Brexit voters, and the British government vowed to end the free flow of EU citizens. EEA member states are required to accept the four principles of freedom, including the free movement of people. Obviously, this is a political risk for any government, so it is unlikely to be accepted. There is a way to solve the immigration problem, but it may not be realistic. Article 112 of the EEA agreement allows non-EU member states to opt out of the four principles of freedom when faced with severe economic, social or environmental pressures. For example, Liechtenstein had used Article 112 to control the free movement of people because of the fear that the size and resources of such a small country could cope with the large influx of people. However, the United Kingdom is unlikely to replicate this situation. What does the “Norwegian model” mean for the Irish border? Perhaps the most powerful reason to choose the “Norwegian model” for the implementation of Brexit is that it will solve the Irish border issue to some extent. By maintaining close contact with EU rules, the United Kingdom will avoid the non-tariff barriers on the Northern Ireland border. The British government does not seem to have found a solution to avoid the hard border of Ireland. It is not surprising that if Teresa May and others begin to soften their attitude towards the issue. Live4Trading.co.uk UK’s Premier Online Trading Guide.